(Birmingham, AL) —Birmingham-based Jemison Metals was named Physical Metals Service Provider of the Year by S&P Global Platts at an event held in London. S&P Global Platts is a leading global energy, metals and commodities information provider, and their annual awards event recognizes exemplary performance in 15 categories spanning the entire steel, metals and mining complex. (Birmingham, AL) —Birmingham-based Jemison Metals has been recognized by the American Metal Market at the national Awards for Steel Excellence . At the annual convention in New York, Jemison was named Most Outstanding Service Center. Nominees were judged according to a variety of criteria including customer retention rates, customer service initiatives, technological innovations, operational improvements, and sales performance over the previous year. Jemison Metals experienced a 99% customer retention rate in 2015 and a 98% on-time delivery rate. Additionally, while the carbon flat-rolled steel industry saw a 7.2% decrease in shipments 2015, Jemison Metals increased their shipments by nearly 6%. Other finalists included Worthington Industries of Columbus, Ohio, Klein Steel Service, Inc. of Rochester, NY, Midwest Materials, Inc. of Perry, Ohio, and Pacesetter of Kennesaw, GA.
Jemison Metals is a leading provider of carbon flat-rolled products. Jemison Metals has 125 team members and in four states. With 412,000 square feet of warehouse space, Jemison has facilities in Birmingham, Gadsden, and Decatur, AL, Lynchburg, VA, Cleveland, OH, and Sumter, SC. Visit jemisonmetals.com. Jemison-Demsey, LLC d/b/a Jemison Metals Birmingham, Alabama, has entered into a definitive agreement to purchase the assets of the Lynchburg Virginia facility of O’Neal Flat Rolled Metals, Brighton CO. The transaction is scheduled to close on or before December 31, 2015. The Lynchburg facility will become Jemison Metals fifth processing location. Other locations include: Cleveland, Ohio; Sumter, South Carolina; Decatur, Alabama and Gadsden, Alabama. Jemison- Demsey, LLC is a wholly owned subsidiary of Metal Solutions, LLC a Delaware corporation. Temper Mill cut to length lines and Stretcher Leveler cut to length lines have both been successfully utilized in applications where superior flatness and stability are required. Typically these applications include lasers, plasmas, or punch presses. When operated properly, both processes provide sheets/plates with minimal residual stress; however, the mechanisms to achieve this low residual stress state are different. This article will discuss only one of the many Temper Mill uses; to improve shape in conjunction with a roller leveler on a cut to length line. Temper mills work the sheet/plate material utilizing compression. The material thickness is compressed and elongated in the rolling direction. 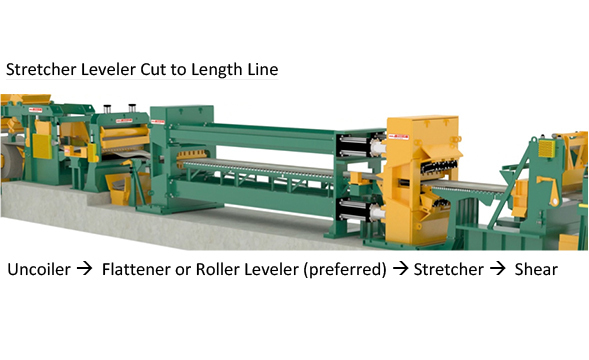 However, as temper mills do not have selective roll-bending across the strip width, a roller leveler must be used subsequent to the temper mill to create the final sheet/plate flatness and to correct for any remaining shape defects (coil set, edge wave, center buckle etc). Additionally, it is important that the incoming material “crown” profile (thicker center and thinner edges) match the temper mill roll profile, otherwise shape defects can be induced. 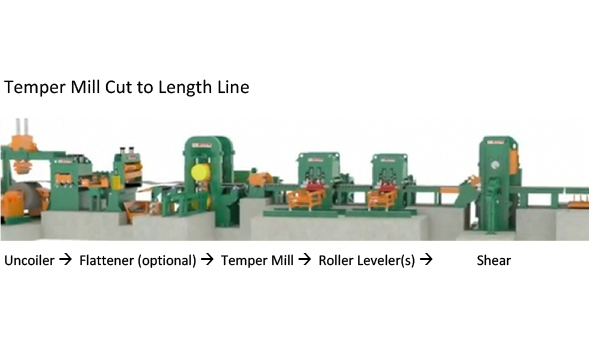 In applications where superior flatness and stability are required, temper mill cut lines have provided superior product to “roller leveler only” product and have been generally accepted as suitable for these applications. It is important to note that temper cut lines do not evenly exceed the yield strength of the material through the full thickness of the material (a gradient of multiple yield strains to zero exists from the surface to the centerline) and that the roller leveling that occurs after “tempering” actually introduces some residual stresses into the strip to create final sheet/plate flatness. Maximum shape correction is limited only by the % reduction capability of the temper mill (typically in the 2%-3% or 2000-3000 i-unit range); however, in practical application the specific order minimum gauge may limit the amount of correction allowed. Modern stretcher levelers have gained acceptance in applications requiring minimal residual stress. In these applications, stretcher levelers have provided superior product to “roller leveler only” product and have been generally accepted as suitable for these applications. Although some stretcher levelers have a flattener installed prior to stretching, it is beneficial to have a roller leveler installed prior to stretching in order to adequately remove crossbow (width-wise surface to surface length differential). This is important because the stretching portion of the process improves only length-wise shape defects (coil set, edge wave, center buckle, camber). During the stretch cycle, the machine grips the steel and plastically deforms/stretches along the entire stretch length. This stretching is similar to the stretching associated with a tensile test. The plastic deformation is performed under tension vs the compression utilized by a temper mill. The yield strength of the steel is exceeded across the entire cross section of the material, which provides an “equalized” stress state in the sheet/plate. Additionally, the stress equalization process is the last process to occur prior to shearing so no further residual stresses are induced. One of the other benefits of stretcher leveling is that camber can be improved during the stretching process. Maximum shape correction of a stretcher leveler is limited by two things. First, the width-wise shape correction (crossbow) is limited by the roller leveler horsepower and separating force. Second, the length-wise shape correction is limited by the % elongation maximum of the stretcher (hydraulic cylinder stroke ÷ stretch length, typically in the 2% or 2000 i-unit range). As with the temper mill above, in practical application the specific order minimum gauge may limit the amount of correction allowed. There are multiple reasons to specify temper passed material. In some cases the need for temper pass may be generic in nature and stretcher leveled product is comparable, while in some cases it is not. Table 1 below lists the typical end user reasons for specifying temper pass and if stretcher leveled product is an acceptable alternative. Table 1: Typical End User reasons for specifying Temper Pass and if Stretcher Leveled Product is a comparable alternative. Table 2: Comparison of some of the benefits & limitations of the three main leveling technologies. 1 The shape improvement potential of temper mills and stretcher levelers are line specific and dependent upon design capacities. These values are given as a reference relative to typical roller levelers for comparison purposes. The link below is a May 2013 article from Modern Metals entitled “Upgrade to flat material”. It discusses stretch leveling vs temper mill cut to length lines from the viewpoint of a service center that operates both types of lines.